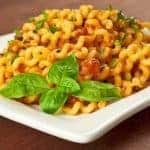 A rich, creamy sauce made with tomatoes, shallots, mascarpone cheese and fresh basil served with a spiral pasta (in this case fusilli) makes a nice change from a classic red sauce. Heat the olive oil in a large pan over medium heat. Add the shallots and sauté until fragrant and just beginning to turn golden. Add the wine and simmer until it evaporates, 1 to 2 minutes. Add the tomatoes, tomato paste, oregano and crushed red pepper. Combine well and season to taste with salt and pepper. Add the mascarpone and stir until smooth and well blended. Remove from the heat and cover to keep warm. Cook and drain the pasta according to the package directions. Add the basil to the sauce, then combine the mixture with the pasta. Plate individual servings and top with grated parmesan cheese. Any type of spiral pasta will work for this dish, but we chose fusilli col buco (aka fusilli lunghi), a cut that looks like thick spaghetti twisted into a loose spring. It’s a fun change from the shorter cuts like rotini and makes a rather pretty presentation.